These cigars are going to delight your senses with a beverage that’s known to please the palate…RUM. Think about combining a nice dark rum with a beautifully blended Nicaraguan long leaf filler. Is that dreamland or what? Well, Camacho ages it’s Corojo filler in Rum barrels for 5 months. Now that’s delightful and sweet. These babies are hand rolled with the finest blended tobacco available. High quality all the way. They smell amazing and when lit, enlighten your senses with dark roast coffee, toast, Oak and a nice caramel sweetness from the rum infusion. 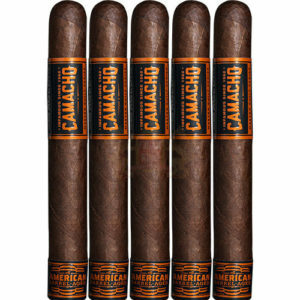 These are lovely cigars with a very smooth draw and fabulous aroma. They are available in boxes of 20 for about $199.